He1 is the Saviour of us all. Sheet Music for Let All That Are To Mirth Inclined from Richard R. Terry, Gilbert and Sandys' Christmas Carols (London: Burns, Oates & Washbourne, Ltd., 1931); "Words and melody from Gilbert's 'Christmas Carols,' 1822"
'Cause wicked men their ways may change. This rude old carol is still an especial favorite with the peasantry. Hone mentions it in his list [See Christmas Carols now annually Printed] and I find that nearly all the broadside printers include it in their yearly sheets. The word "mirth" was certainly not used by the author in that irreverent sense which it now usually conveys. Religious joy was intended, not boisterous merriment. In an old edition of Deloney's "Garland of Good-will," this carol is given under the title of "The Sinner's Redemption." Sylvestre also notes that the word "silly", found in the last line of the fifth verse, is an old word for simple or inoffensive. Note that Hugh Keyte, an editor of The New Oxford Book of Carols (Oxford: Oxford University Press, 1992) believes that "Joshua Sylvester" is a pseudonym for a collaboration between William Sandys (1792-1874) and William Henry Husk (1814-1887). See Appendix 4. Keyte and Parrott have excellent notes to their version, #140. This is one of the most popular carols. 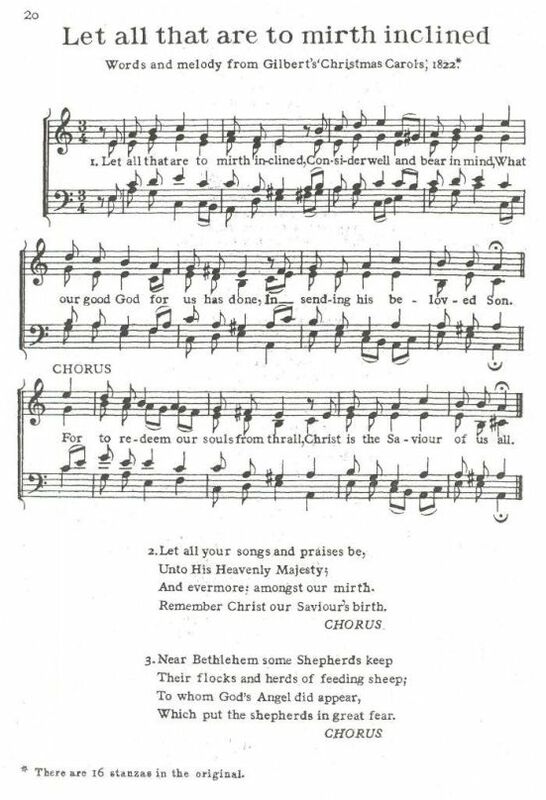 It is annually reprinted by the broadside printers, and is included in most of the existing collections of carols. Possibly the oldest known copy of this carol is that contained in the undated edition of Thomas Deloney, "the ballading silk-weaver's," Garland of Good Will, believed to have been issued in 1709. It is there entitled, "The Sinner's Redemption: The Nativity of our Lord and Saviour Jesus Christ, with His life on earth, and precious death on the Cross." Although appearing in that publication there is no reason for supposing it to have been written by Deloney, who died in 1600; but there is no doubt of its being of considerable age. The copy printed in 1709 consists of twenty-eight verses, but wants the burthen, "And to redeem," &c; the last twelve of these verses, however, are commonly omitted, as relating not to the commencement of our blessed Lord's career on earth, but to its conclusion. The shorter version, as being the most generally used, is here retained. In Davies Gilbert's collection the carol commences, Let All That Are To Mirth Inclined; and there is extant a sheet of music issued by a London publisher (who withheld his name) about 1775, containing a short version of the carol, differing from Gilbert's, but commencing in the same way, set to a tune composed by J. A.; — M. B. — possibly John Alcock, organist of Lichfield Cathedral, or his son, John. In a copy in the Roxburgh collection of Ballads the carol is directed to be sung "To the tune of My bleeding heart, or, In Crest." Husk restores the 15th verse as found in Gilbert. Otherwise, Husk reproduces the version found in Sandys, with only minor spelling and capitalization differences.